The ACLAIIR blog is delighted to welcome Nadia Kerecuk as our guest writer for this piece about the Brazilian Bilingual Book Club, convened by Nadia herself and hosted by the Embassy of Brazil in London. Discussing José Pereira da Graça Aranha’s work ‘Canaã’, (English Title: Canaan), the group found many topical points on issues of migration – particularly pertinent given current events in Europe. For an introduction to the book, including a biography of the author and details of available editions and translations, take a look at Nadia’s excellent article here. Our summer meeting, the eighth in this year of our book club, proved to be a very engaging session. We were also delighted to welcome another three new members to our book club. The members offered a fabulous selection of their favourite quotes from the novel, which kick-started a fine discussion on the quality of the novel and its relevance. The very topical subject of migration in the novel opened up an opportunity to look back at part of the history of the migrations into Brazil from the first decades of the 19th century. The discussions also brought to light the fact that there had already been various government initiatives to colonize the vast territory of Brazil by bringing European immigrants (from western to eastern Europe) by mid-19th century and also forward planning aimed at replacing the African slave labour force eventually when the abolition of slavery would be finalized. Inevitably, the emergence of unregulated agents accelerated the number of immigrants that were brought to work on the coffee plantations, railway building, logging of the Araucaria forests in the south and various other activities could be described as a consequence of those earlier policies. More often than not, people that wanted to emigrate from Europe and elsewhere were seduced by the promise of an El Dorado in Brazil and came to be entrapped by such agents, often having to cope with multiple challenges with very little official support. After WWII, Brazil was one of the four countries in the world that accepted displaced people from the forced labour camps in Nazi Germany. Canaan, albeit fictional, will certainly remain a valid source for the history of settlements (‘colonies’) of immigrants in various places in Brazil. Various book club members had not realized that Germans had gone far northward in Brazil, including the state of Espírito Santo. Our book club members also commented on the exhuberant nature of that part of Brazil along with the realization that it is located in the Atlantic Forest and the Serra do Mar (vast mountain ranges that extend along the coast of Brazil from the state of Rio Grande do Norte to Rio Grande do Sul). The obfuscating glare of the sun, the beauty of sunrise and twilight and in the evenings the glorious lights of glow-worms are some of the lasting images stayed with the readers. Another common aspect of the life within communities of immigrant settlers is a degree of ghettoization – akin to any other such communities universally. The fact that families bring their own traditions, languages, cultures and manners of approaching life along with memories from their own birthplaces to their new country, triggers off a concomitant process of preserving them for future generations and safe-guarding them from external local influences and the local law. G. Aranha demonstrated a significant degree of understanding of this phenomenon obviously benefitting from his own experience of being a ‘domestic migrant’ as he was born in the state of Maranhão, studied in Recife, Pernambuco and travelled to work as a judge to Espírito Santo and elsewhere. Inevitably, the legacy of immigrant traditions would get diluted and blended in massive melting pots of the Americas, the new world yet to be built. The author also provided an insightful critique of such communities and of the way that the governments failed to deal with some of their challenges and concerns. Our meeting has benefitted from the insights and experience one of our members, a descendant of such immigrants in the state of Rio Grande do Sul, in referring to German immigrations into Brazil and the various communities that they set up there. A relevant aspect was also discussed regarding some Brazilians that had become either enthusiasts or shared some of the values of the 19th century German culture. At that time, those German ideas were perceived as a means of curbing the excessive influence of French ideas in Brazil. For instance, this was the case of Tobias Barreto (de Meneses – 1839- 89), that influenced G. Aranha as his teacher. Tobias Barreto was a philosopher, legal scholar, poet and literary critic that taught law at university. In his memoirs, G. Aranha extols T. Barreto’s virtues and offers an account of his intellectual contribution to various key Brazilian institutions. The matter of views on races, which prevailed in the last quarter of the 19th and at the beginning of the 20th centuries was also discussed – Lentz and Milkau illustrate them but there is a broader network of internal dialogue within the narrative. Some of the views expressed by the characters were as repugnant and unethical as they can be and quite common at the time. Discussions on race and ethnicity continue to be most contentious and controversial causing much misunderstanding. Equally, one is also reminded that there is a return to discussions on race and ethnicity in academic circles currently re-enlivened by recent scientific advances in the study and analysis of the human genome. 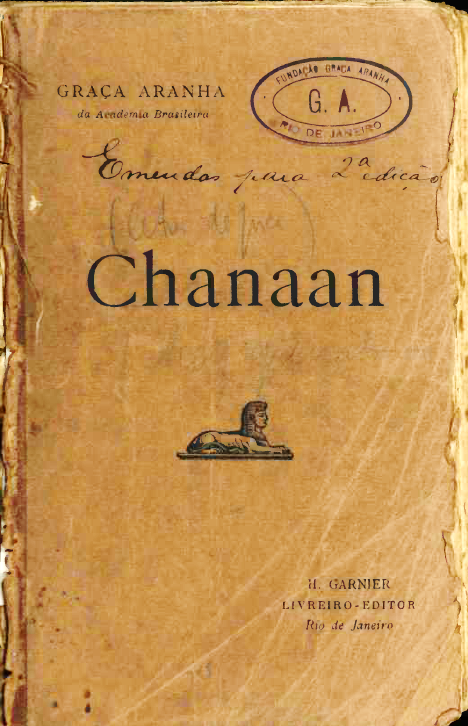 However, in the fictional universe of the utopia in Graça Aranha’s Canaan, a solution of sorts to this moot point seems to be put forward, which could only be found in the new world, the new ‘promised’ land in the Americas. Apropos, it is worth mentioning that when The New York Times reviewed the novel in 1920 in a long article, immediately after the publication of its translation, the reviewer stated that Canaan ‘views humanity through the telescope of cosmic philosophy, as a baby taking its first uncertain steps toward Utopia.’ [An Epic of Today in Brazil, 11 Apr 1920]. Canaan brings various references to thinkers and events in the world at the time it is set. We discussed several references. A young nation seems to require a heroic history based on the local ancient tales and legends. This theme is adroitly introduced with an analogy in the covert reference that the narrator makes to the Ring Cycle (The Ring of the Nibelung) by Richard Wagner (1813-1883) that includes ancient Norse sagas. This novel gained another accolade from one of the leading French authors at the time, Anatole France (1844-1924), that hailed Canaan as ‘The Great American Novel’. Yet, despite all of the positive reviews, claims that it was a first Brazilian international best-seller, with rather excessive hype, the novel fell into oblivion so much so that it was only recently that it was reprinted. Our book club members agreed that it is a fine novel. In fact, it is a significant classic considering what other authors in various cultural and intellectual centres were writing at the time. It is a very ‘modern’ novel in the way that it approaches its main themes. Therefore, no surprise that this author and diplomat would subsequently become a leading cultural activist in the 1922 Week of Modern Art in São Paulo. The book club has featured in a recent article in The Linguist: http://thelinguist.uberflip.com/h/i/119188544-the-linguist-54-4 Pages 12-13 and further details including upcoming books for discussion can be found on the Embassy’s website http://culturalbrazil.org/category/books/bookclub/. This entry was posted in 19th century, brazil, brazilian literature, latin america, latin american history, latin american literature and tagged book clubs, José Pereira da Graça Aranha, migration on 11/09/2015 by ACLAIIR.